Yes, we’re talking about Hansel Robles. ear were inconsistent at best. In a 7-5 season, he put up a 4.92 ERA with opponents slashing .226/.332/.418. Nevertheless, he had flashes of adequacy: in July, he went 2-0 in 6 games with a 1.35 ERA over 6 2/3 innings pitched, and although he was 1-4 with a blown save in August, he put up an acceptable 2.81 ERA with an opposing slash line of .135/.308/.192. For a guy with a .52 GB/FB ratio and a reputation as serving up homers, going a month and a half with only two home runs was quite an improvement. In his small sample size this year, Hansel has shown a .22 GB/FB ratio – that is, the vast majority of the contact made results in fly balls, making him a liability within Citi Field. (Surprisingly, he had a .281 SLG against at home, compared with a .585 on the road – shocking considering Citi’s short fences.) Still, manager Mickey Callaway called him up when the team needed a reliever and has been using him somewhat regularly – Hansel is 2-0 with a 1.80 ERA in five games so far. Choosing Hansel’s appearances carefully seems crucial: the graph above shows Hansel’s OBP-against by batting order position, compared with the league’s. Gary Cohen last night noted that Callaway seems to be bringing Hansel in primarily against the bottom of the order, and in fact in 2018 he was significantly more effective against hitters hitting sixth or later than the National League average. Posted by tomflesher in Hockey, Sports. 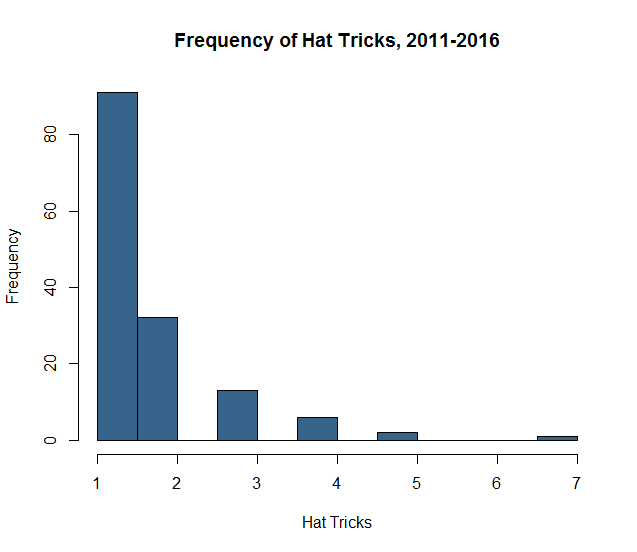 Yesterday’s post on hat tricks raised a question – what’s the historical likelihood of a hat trick? 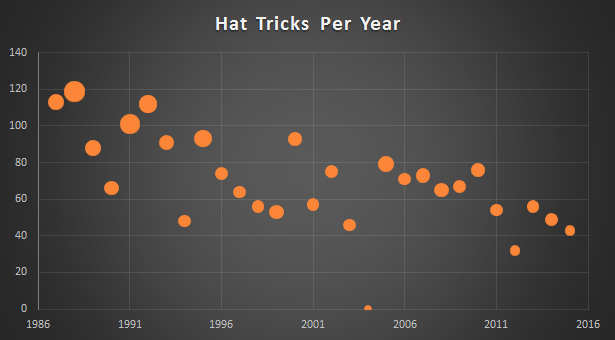 Above is a time series of hat tricks by year, with bubble size weighted by the number of hat tricks scored by that year’s leader. The largest bubble is Mario Lemieux with 9 in 1988-89. The largest since 2000 was Jonathan Cheechoo with 5 in 2005-2006. This looks like a significant downward trend, and it is; with each passing year, and controlling for games played, the expected number of hat tricks declines by about 1.2 (p = .0147). Meanwhile, adding another game to each team’s schedule seems to increase the number of hat tricks in a season by about .85 (p = .00005). There’s no statistical persistence of the numbers (that is, the lag of hat tricks has a coefficient not statistically different from 0). This downward trend is a bit confusing, since at first glance there hasn’t been a visible decrease in the quality of goaltending. That’s probably my next project. In Sunday’s pre-Super Bowl game, the Islanders took out the Pacific division cellar dwellers, the Oilers, in an 8-1 rout. That’s not only tied for the largest goal differential this year, it’s also the most goals scored by any team this year. Kyle Okposo assisted a Nikolai Kulemin goal at the end of the first, scored two in the second about three and a half minutes apart, and sealed the hat trick with the only goal of the third period. Cal Clutterbuck also had a goal and an assist (on Johnny Boychuk‘s game-opening goal). Connor McDavid had the only goal for Edmonton. Okposo’s hat trick was the 43rd of the season; probably the oddest was a baffling performance by Rasmus Ristolainen in December, in which he scored all three Sabres goals in a losing effort against the terrible Calgary Flames. Mikkel Boedker, John Gaudreau, Zach Parise, and Jeff Skinner each have two hat tricks this year. No one has cracked the three-hat-trick mark this season, although Max Pacioretty and Joe Pavelski each did so in 2013-2014. Hat tricks are interesting to model, because there are many complications in scoring them. Like John Scott‘s 2-goal performance in the All-Star game, it’s likely that hat tricks can be massaged along by teammates – feeding a player with two goals the puck in scoring situations, for example – so it’s difficult to argue that they can be poisson distributed (which would require their occurrence to be random). On the other hand, there’s clearly a reason why only 145 players have hat tricks over the last 5 seasons, why so few players have so many (Tyler Seguin with 7, two with 5, six with 4, 13 with 3, 21 with a pair, and the remainder with a single). The graph at right shows how thinly spread hat tricks tend to be over the past 5 seasons. Last night’s Sabres at Bruins ended on a controversial call. NESN described the hooking call on Rasmus Ristolainen as “questionable at best,” but Brad Marchand was awarded a penalty shot 2:32 into the overtime period. Ristolainen was skating hip to hip with Marchand; Marchand flipped Ristolainen’s stick out of his hands while Risto was attempting to play the puck, and Ristolainen followed up with a two-handed shove. Bafflingly, a hook was called, despite Ristolainen’s lack of a stick. In the video below, the “infraction” is signaled at 0:13, well after Ristolainen loses his stick. Hooking – Hooking is the act of using the stick in a manner that enables a player to restrain an opponent. penalty shot should be awarded but the appropriate penalty should be signaled and assessed if a goal is not scored on the play. “Control of the puck” means the act of propelling the puck with the stick, hand or feet. If while it is being propelled, the puck is touched by another player or his equipment, or hits the goal or goes free, the player shall no longer be considered to be “in control of the puck”. It’s entirely possible that Lehner would have given up a goal eventually, but to award a penalty shot – Marchand’s second this season! – rather than a two-minute minor – if anything at all! – was a seriously questionable call. Despite a rough second period last night, Robin Lehner was in it for the whole game and the Sabres brought home a 4-2 win over the Montreal Canadiens. The Sabres scored 1 goal in the first and 3 (including an empty-netter by Brian Gionta) in the third to come back from a 2-1 deficit. Lehner notched a save percentage of .943, saving 33 of 35 shots on the night. Montreal’s first goal came at 03:19 of the second, 1:08 into a Johann Larsen hooking penalty; it was the first time this season that Lehner allowed a power play goal. The team is 2-4 on the season in Lehner’s starts. Montreal goalie Mike Condon seemed to lose equilibrium in the third; he faced 10 shots and allowed two goals. In the first two periods, he saved 20 of 21. Condon is 13-15-4 in starts, and the Canadiens are 1-2 in games where he’s come in to relieve Carey Price or Dustin Tokarski. Condon is 4-4 in overtime games, with one of those losses coming in a shootout, so he doesn’t seem to be a guy who gets exhausted and crumbles; he may have just had a nasty period. The Sabres host Boston tonight; the Bruins have won their last three road games. Lehner will likely start against Tuuka Rask. Boston backup Jonas Gustavsson was placed on the injured reserve list with heart problems on February 1; the Bruins called up Malcolm Subban to serve as backup while Gustavsson is injured, but I’d be surprised to see the 22-year-old Subban (5.76 GAA in one career game) called on to start. Posted by tomflesher in Economics, Hockey, Sports. 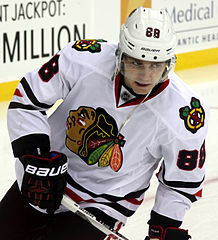 Patrick Kane (right) leads the league in goals and assists (and therefore total points). His Blackhawks are second in the league but lead the Western Conference, and are all but a lock to make the playoffs this season even with 29 games to go. Kane’s 30 goals (and 27.8 goals created) are a touch ahead of the second-place Jamie Benn and Alex Ovechkin, who each have 28 goals. Just how much, though, are those extra goals worth, and would it be better to focus on defense instead? In this entry, I’ll use some econometric modeling techniques to float an answer to that question. When a team wins a game, they receive 2 points in the standings; a team that loses in regulation receives no points, but a team that loses in overtime or a shootout gets a consolation point for the tie after regulation. Since points, rather than direct win-loss records, are used to determine who makes the playoffs, it’s possible for a playoff team to have fewer points than a team that doesn’t make the playoffs. Though that didn’t happen in 2014-15, the Nashville Predators did finish ahead of the eventual Stanley Cup winning Chicago Blackhawks by having more points (104 to 102) despite having one win fewer (47 to 48). Nashville’s 10 overtime losses to Chicago’s 6 made the difference. In a previous post, I calculated a pythagorean exponent useful for estimating a hockey team’s win-loss percentage and found a value of 2.11; a similar method to calculate the percentage of available points yields an exponent of 2.09. (That is, win-loss percentage and points percentage are really fairly close, in expectation terms.) Those models make the assumption that a goal against is worth the same as a goal for. Let’s try a couple of things to estimate the usefulness: first, let’s keep the same assumption, and fit a model of Points = a + b*Goals For – b*Goals Against. Using 2014-2015, that gives us an optimal model of Points = 92.2 + .357*Goals For – .357*Goals Against, with a sum of squared errors of 557.355. Relaxing that assumption – allowing a goal for to be worth a different amount than a goal against – is theoretically justified by the fact that a losing team not only scores no points but loses the opportunity to score an overtime point, too. If we allow that flexibility, 2014-2015 gives us an estimated Points = 88.2 + .366*Goals For – .347*Goals Against, with a sum of squared errors of 555.594. Since 88.2 points are expected in a season of 0-0 games, the expected points at the beginning of a game are approximately 88.2/82 = 1.076. Someone scores two, but the point given to the eventual losing team for a regulation tie pulls that average up a smidge. The upshot of all of this? Defense is important, but since the expected points for a goal are higher than the expected penalty for allowing the other team to score, a team at the margin should consider signing a roving defenseman rather than a strictly defensive player – and it wouldn’t be crazy for a losing team to play four attackers and one defender for the last few minutes of the game, even before pulling the goalie. Following the technically brilliant performance of John Scott in last night’s All-Star Game,1 the NHL is slightly past its midway point in the season. Most teams have played 49 of their 82 games, and while the Buffalo Sabres haven’t been mathematically eliminated yet, winning every game for the remainder of the season would only get them as many points as last year’s third-place finisher in the Eastern conference. In other words, it’s spring. Currently, the Eastern Conference would send Florida, Tampa Bay, and Detroit automatically to the playoffs from the Atlantic division, along with Washington and both New York teams. The wild cards would be Boston and New Jersey, with the latter at 52 points. The Sabres have 44. The Western Conference would send Chicago, Dallas, and St. Louis from the Central and Los Angeles, San Jose, and Arizona automatically from the Pacific. Both wild card slots would come from the Central, going to Nashville with 56 and Colorado with 57. Minnesota (55) would be edged out, though they’d have made the playoffs instead of Arizona under last year’s system. That’s a pisser for the Wild, who are actually playing about 3.3 wins below expectation; in other words, for their goals for and goals against, we’d expect about 26.3 wins, but they only have 23. Arizona, meanwhile, is at 24 wins, but “should” have only about 21.7. Though Minnesota can overtake Nashville or Colorado relatively easily, it looks like the more competitive Central division is going to lead to someone being excluded from the playoffs who would have made it under last year’s system. Luck numbers through the All-Star Break follow. 1Since I will never be able to type that phrase again, I figured I’d use it while I could. Below is a plot of NHL teams’ Pythagorean luck through games played on December 10. The bubbles are scaled to the number of wins each team has. Shockingly, the 12-16 Calgary Flames are 2.4 wins above their expectation, meaning that they should really be a 10-18 or 9-19 team right now. Meanwhile, the Canucks are suffering at 3.4 wins below expectation; at 11-19, they could easily be a .500 team if a few pucks had bounced differently. On Saturday, the Sabres managed to turn another close game into a decisive loss, and once again the game turned on the power play. Down 1-0 entering the third against Lindy Ruff‘s 16-4 Stars, Tyler Ennis took a crucial holding penalty to allow the Stars onto the power play. Though the Sabres had killed a trio of second-period penalties, they couldn’t take advantage of Dallas’s three penalties (including 51 seconds on the two-man advantage to start the second period). Jamie Benn knocked it in on the power play and then followed up less than two minutes later with a second goal; Antoine Russel had the go-ahead for Dallas in the first period. 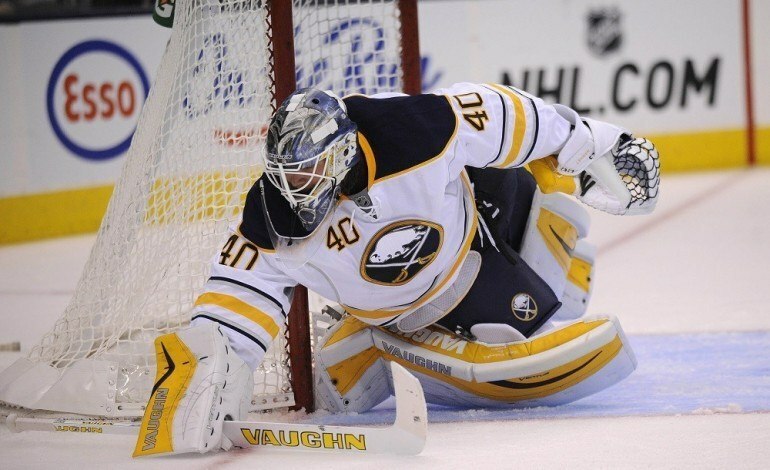 Chad Johnson was back in net and saved 29 of 32, but the Sabres only took 22 shots on net. Dan Bylsma is on record as saying the quality, not the quantity, of shots is his aim. Bylsma certainly hasn’t rewarded a high proportion of shots while on ice; he’s rewarded players like Rasmus Ristolainen and captain Brian Gionta, both of whom are well below the 50% mark (meaning that the opposition takes more shots than the Sabres while Ristolainen or Gionta are on the ice), but Ristolainen is averaging almost 23 minutes per game and Gionta is hovering just below 18. In general, more minutes lead to more shots, of course, but there’s little informative about that. 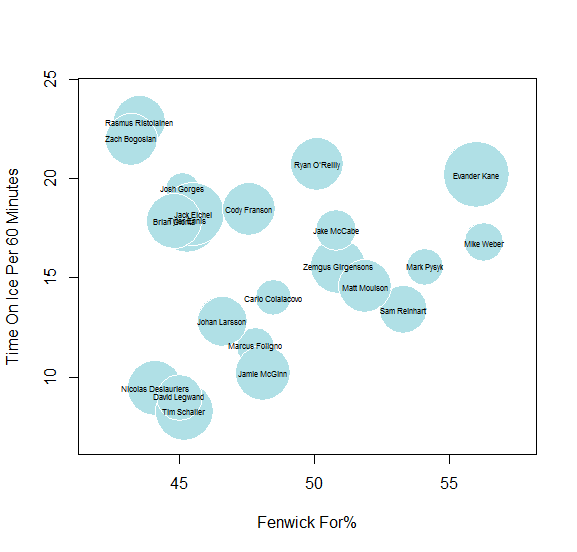 Below is a bubble chart with Fenwick For% on the x-axis; Fenwick For% is the percentage of the total shots taken and attempted while the player is on-ice that were taken by the Sabres. On the y-axis is minutes per game. The bubbles are scaled by shots attempted by the player divided by total time on the ice, to show how influential each individual player’s shooting is on his own numbers. Bubbles are scaled by shots taken per minute on ice. Evander Kane is hovering up around the 20 minute mark; he’s a clear outlier in terms of number of shots per minute, at 64 shots and averaging around 20 minutes per game. He’s also up on top of the Fenwick For%, at 56.0. As far as shots per minute, the decision seems to be hit and miss; of course Zach Bogosian is going to get some ice time to reacclimate despite not taking tons of shots, and Jack Eichel, Tyler Ennis, and Gionta are clustered around the 15-20-minute mark despite their low Fenwick numbers because of their relative importance to the team. Oddly, Josh Gorges is clustered right in there with them; like Ristolainen, his low Fenwick numbers seem to raise flags about his defense. Still, the shots per minute on ice seem to be scattered fairly randomly throughout the lineup. Not every player is a scorer. It’s distressing, though, to see a player like defenseman Cody Franson taking 75 shots and averaging 18:27 over 20 games when he doesn’t seem to be preventing all that many shots; his 47.6 Fenwick For% is well below the 50-50 mark we’d hope for. Meanwhile, Chad Johnson’s .901 save percentage ranks him 50th out of 68 goalies in the NHL and he’s sporting a 117 GA%, meaning he’s allowed 17% more goals than average. (Linus Ullmark has an 87.) Ullmark may not maintain this consistency, but the Sabres have to protect Johnson if they’re going to keep these tight games from breaking open. St Louis visits Buffalo tonight. Ullmark will start; his counterpart will likely be Jake Allen, who has a .930 save percentage to Ullmark’s .926 and an 82 GA%. Allen, 25, is a solid young goalie, but so is Ullmark. This one will depend on solid defense …. and, hopefully, avoiding power plays.